The perfect step aerobics music can make a big difference in your cardiovascular workout. Music for step aerobics has slightly different requirements than music for other types of cardiovascular fitness activity. Step aerobics grew to popularity in the late 1980s when gyms and fitness centers began using adjustable steps to increase the intensity of aerobics classes. The inventor of step aerobics, Gin Miller, conceived of the classes in 1989. Soon, individual platforms that could be adjusted by adding risers began appearing in aerobics classes across America. Instructors enjoyed having a new way of teaching fitness to their students, and the steps provided a way to customize intensity. They also provided a platform for many strength training moves used during the classes. 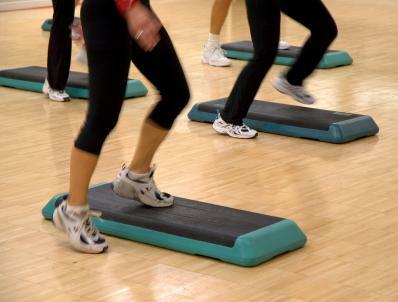 Step aerobics remains a popular more than 20 years after its invention. You can also include music for strength training activities such as push ups or abdominal crunches that is about 130 beats per minute. Strength conditioning activities should follow the cool-down but precede the stretching. Power Music has multiple CDs with music in a variety of ranges, including 120 to 130 beats per minute. Faithfully Fit has Christian music for step aerobics. If you plan to create your own music mix for step aerobics, try these tips for success. Choose music that motivates you. Find music that you love, and save it for use during your workout. If you can only listen to the songs when you workout, then you may be more motivated to exercise. If you are a beginner, start with slower music that ranges from 120 to 125 beats per minute for the main body of the workout. As you get in better shape, you can choose music with a slightly quicker beat. Make sure the music you choose has a beat that is easy to recognize and follow. Create a mix on your MP3 player of several songs for step aerobics. That way, you can vary the music you choose for different workouts to keep it fresh. Don't skip the warm up, cool down and stretching, which can help prevent injury and soreness. Ask friends which music they use and trade songs if you have similar taste in music. Avoid music that is too fast (quicker than 135 beats per minute). Using music that is too fast can lead to safety issues. With some careful planning and an MP3 player, you'll be able to create your own, motivating aerobics step music in no time. Follow the tips above, and choose music that inspires you to work out.